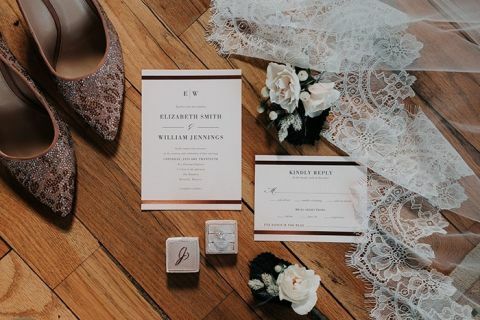 Romance by candlelight takes center stage in this luxe boho wedding day at The Standard Knoxville! High school sweethearts Elizabeth and Will planned a wedding day that fit their laid back style but brought the drama with an industrial venue filled with lights, greenery, and flowers! T&K Photography and The Katelier helped the couple envision their wedding day, along with the baker bride’s crew at Magpies Bakery! Will proposed to his high school sweetheart with a romantic walkway lined with candles, so it made perfect sense that their wedding day would incorporate the perfect mood lighting. 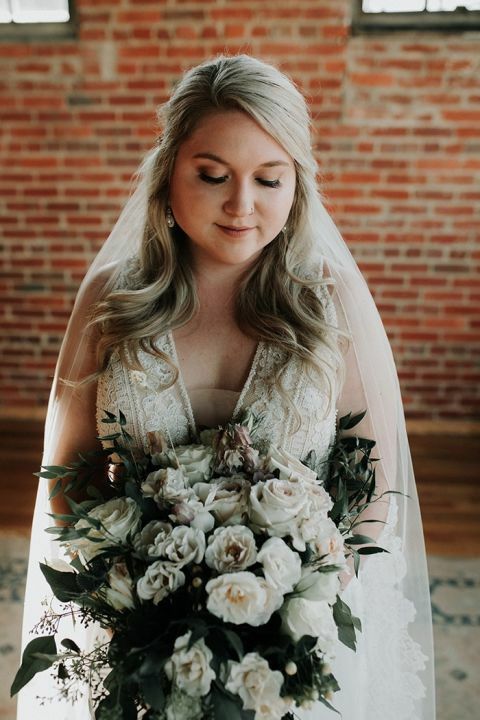 The warehouse setting of The Standard Knoxville added an industrial backdrop to Elizabeth’s muted palette with pops of blush and swags of greenery. The Katelier added an organic element to the concrete and brick walls with an altar draped in garlands of green leaves and blush flowers, accented with glowing candles. The aisle was lined with clusters of pillar candles nestled in eucalyptus wreaths to recreate the romantic atmosphere of their proposal! 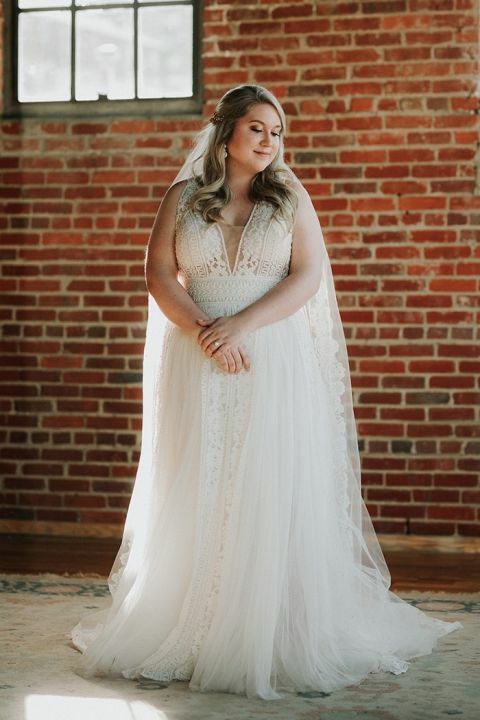 Elizabeth channeled the perfect luxe boho bridal look with her blush lace and tulle wedding dress paired with a lace trimmed cathedral veil. 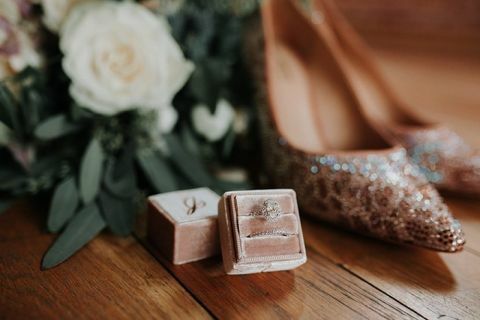 She carried an oversized bouquet of blush and ivory roses in a clutch of greenery with a rose gold hairvine to add a subtle touch of glamour. 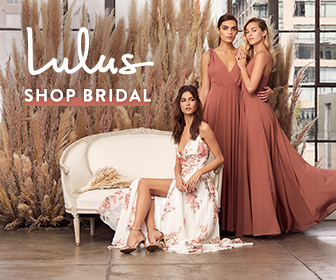 She opted for a small bridal party, and chose a blush tulle gown for her maid of honor while the groom and his best man looked sharp in shades of gray and black. T&K Photography kept the dramatic lighting going with magic hour photos of the bride and groom just before sunset. Twinkle lights overhead captured their intimate portrait session, before joining their guests in the warehouse reception space. 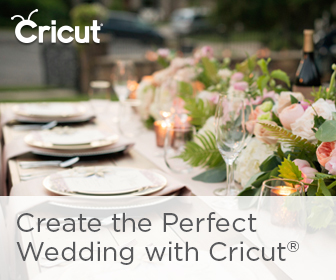 Long wooden tables were set under swags of string lights adorned with greenery, echoing the organic table runners that served as long centerpieces. A baker herself, Elizabeth had long settled on her wedding cake from Magpies Bakery, and opted for funfetti while her groom picked chocolate peanut butter. The couple sent guests home with chocolate chip cookie favors in kraft paper bags for a midnight snack!